A week or so ago, I was invited to speak at the ND16 Digital Leaders event, on the subject "Culture, behaviour and transformation". Here's what I said on the day. I’m pretty sure many of you have seen me speak at events like this before, and you’ll know that most of the time, I’m talking about digital transformation. Today, I want to talk about how transformation relates to the culture and behaviour we see, and expect to see, in our workspaces. 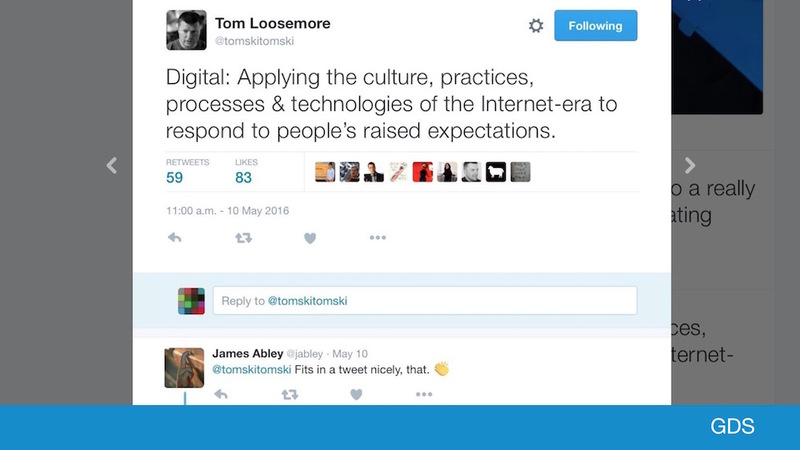 That relationship begins with what we mean when we say “digital”. It’s important to be clear about it up front, because to start with: “digital” isn’t about computers. That’s brilliant. That’s it, in a nutshell. It’s not about computers. It’s about people. Transformation means understanding what your people are capable of, the skills they have, and how to best put them to good use. It’s about trust, and giving your team a mandate to do what they think is right. If you foster the right environment of creativity, of trust, of empowerment, you get better results from your team. 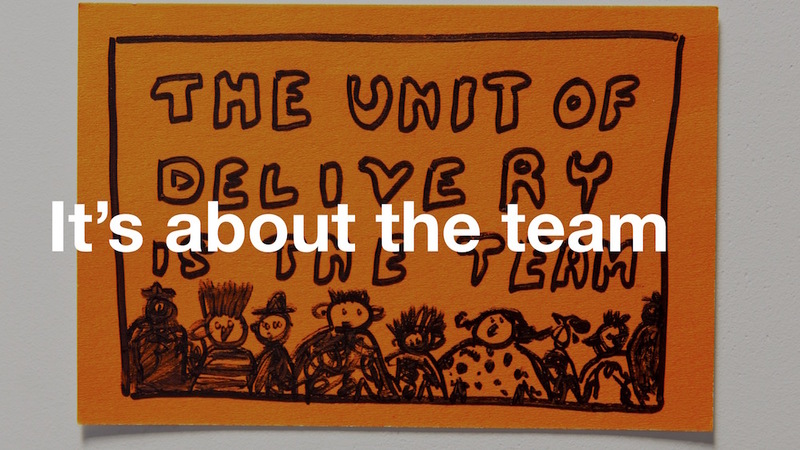 And the team, as we’ve been saying for years now, is the unit of delivery. We believe multidisciplinary teams are essential for good agile working. If the team’s not right, the thing it’s working on won’t be right either. To do digital transformation well, you need to focus on building and maintaining the team, bringing people together and giving them space to thrive. That’s why culture and behaviour matter so much. Of course, none of this is a new idea. Thinking like this is commonplace in the private sector, especially in the technology industry. But it’s not always the norm in government. We’re a few years behind the rest of the world, we’re still catching up. But we know we can, and we know we will. Bringing about that kind of change is a big step. It means change, and you have to handle change with care. At GDS, we’re fortunate because we’re a relatively new organisation. We were able to build our own culture from scratch. 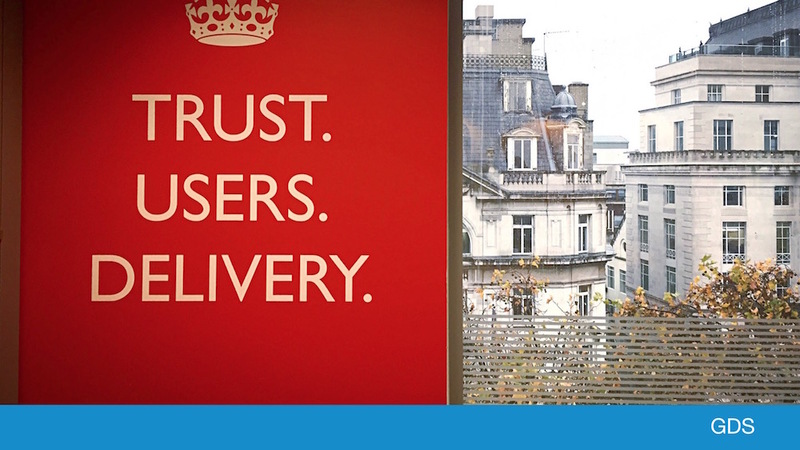 Much of what GDS has become began in its very early days, when a small team of people were building the GOV.UK alpha. But since then it has iterated, evolved, and changed, just like the products and services we make. The goal has been to encourage and foster a work environment for humans. To build a place that recognizes people’s humanity just as much as their employability or productivity. So now I’m going to show you some examples of what a humane, people-focused workplace looks like. Or at least, what ours looks like. The best known chunk of GDS culture is our list of design principles. They started as a bunch of sticky notes stuck on a wall during the GOV.UK alpha phase. Don’t let the name mislead you - they’re not just about design. They’re built on collective wisdom. They’re a guidebook, a staff handbook, a learning tool and a motivational tool. We know that if we’re doing what the Principles tell us to do, we’re doing the right thing. If GDS culture began anywhere, it began with these. Should you ever come and visit us, you’ll see the culture all around you. Our office is colourful, decorated with bunting. Our walls are used for thinking out loud and for sharing work with colleagues. The environment produces the atmosphere, and the atmosphere produces the work. Internal communication is very important, and too often overlooked. We don’t always get it right, but one thing we’ve found that does work is communicating via the walls. We make posters to remind ourselves about stuff that matters - for example, we made posters that explain why user research is important, and why everyone should take part. We trust GDS staff to behave like grown-ups, to foster a good environment for all. If anyone behaves badly, they’re abusing that trust. That gets spotted and dealt with pretty quickly when it crops up, which is rarely. Last year, we set up a body called the People Board. It’s a group of about 12 people, nominated and elected by their peers. They meet regularly to discuss ideas and suggestions for making GDS a better place to work. The management empowered the People Board to decide things (again, there’s the theme of trust and empowerment). If the Board think something is a good idea, it should get done. They set up whiteboards on the walls around GDS, where people could comment anonymously about the things that bug them. So far, the Board has helped fix some small things, like tea and coffee supplies in the office -- and some big things, like making performance management better. It’s management done by the team, rather than by managers. Good culture spreads when the organisation shows its support. 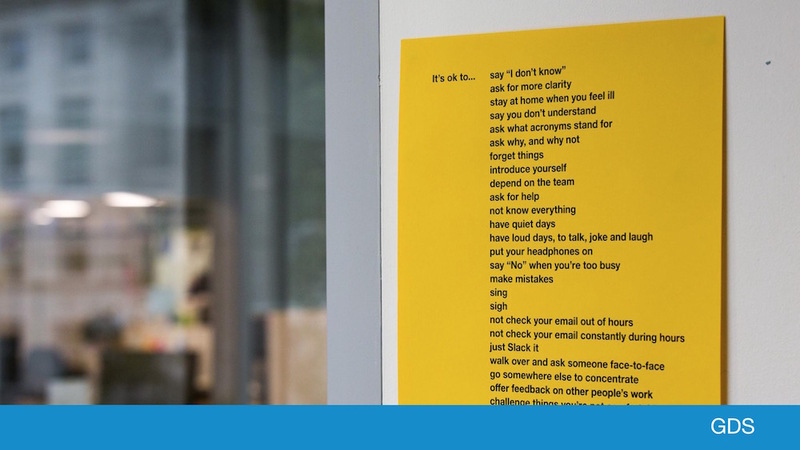 Another example of that: some of the team spontaneously wrote a list of the unwritten rules, and turned that into a poster too. It was a list of things that it’s useful to know when you start working at GDS, but that it’s no-one’s job to tell you. It was a huge hit. We tweeted it, and now it’s up in other departments too. It’s gone all over the world. Good culture evolves spontaneously, and spreads all by itself. Sometimes, though, things happen that are not ok. About a year and a half ago, GDS was struggling to be its better self when it came to the treatment of women. So when something like that happens, the team self-organises to do something about it. Some of them set up a Women’s Group. It’s a group for everyone, irrespective of gender, who cares about having an equal and diverse workplace at GDS. That group has been up and running for over a year now, and has been hugely influential and successful. the GDS parity pledge for diversity at conferences and events; as a result, we have new rules: no-one from GDS will take part in a panel discussion of two or more people unless there is at least one woman on the panel, not including the chair. And: no-one from GDS will speak at an event unless the event's organisers are clearly working hard to address gender diversity on stage. We’ve had to have the courage of our convictions to see that through. It’s not about absenting ourselves from those conversations, it’s about making those conversations better. None of that would have happened without the Women’s Group. That’s a whistle-stop tour of GDS culture, but I hope it gives you an idea of how we do things. 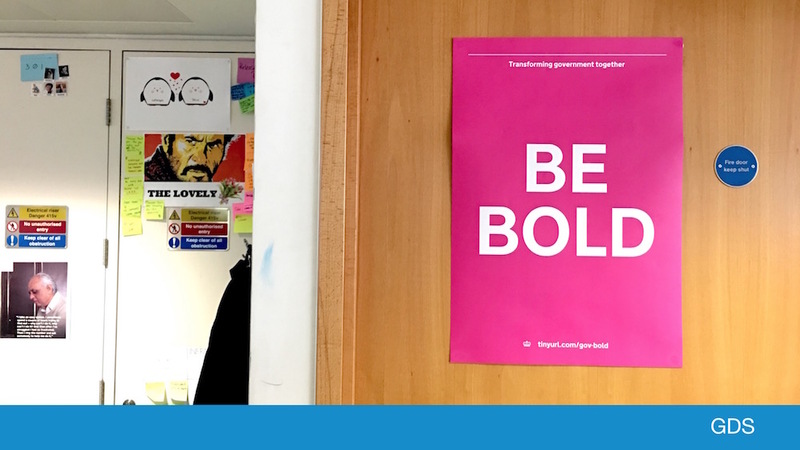 None of those things I just showed you - the posters, the People Board, the Women’s Group, the being bold, the saying what’s ok and what’s not - none of that came from me. That would never work. You can’t impose culture upon your team. You can’t tell them how to act. Your job as a leader is to provide the right environment in which culture can emerge and evolve all by itself. That means trusting your people, and ensuring they feel safe; safe to ask questions, safe to make mistakes, safe to do what they think is right. 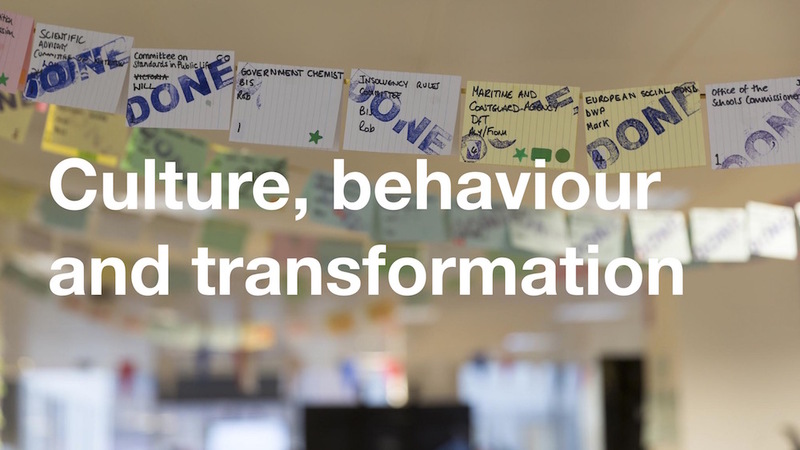 Change doesn’t happen overnight, and the GDS culture is still changing day by day. I see it as a cycle of improvement. 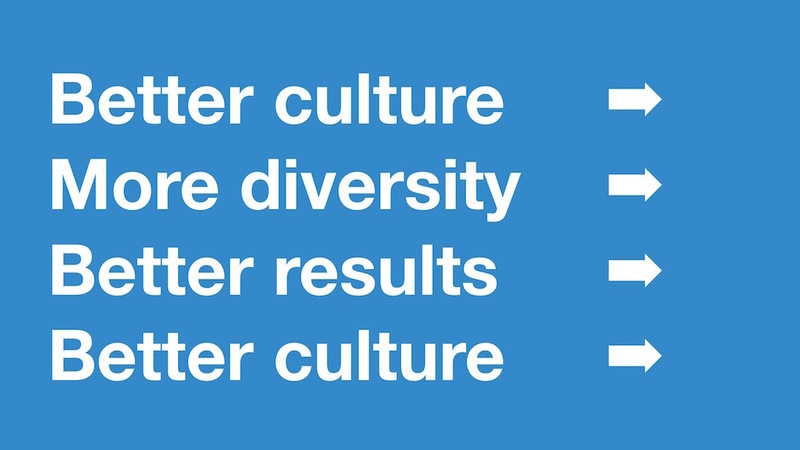 Better culture (through trust, safety and empowerment) means more diversity. More diversity means better results. Better results build a better culture - and so it goes on. Follow Stephen on Twitter, and don't forget to sign up for email alerts. I have experienced GDS first hand. Naive, is one interpretation - reckless another. The team lacks any appreciation of the complexities entailed in delivering high quality transactional software you can run an organisation on. Very quick to dismiss the status quo and existing IT capabilities, but incapable of matching the rhetoric with delivery. The money gets spent and the organisation is worse off. The sooner there is a root and branch review the better. I agree with Graham. Dissing the rest of your colleagues in government wasn't helpful when GDS began and continues to be unhelpful now. Many of us are light-years ahead of you in our transformational thinking and culture.